Chicago based Groupon which started selling its daily deals in Canada on April 19 in Toronto and on April 26 in Vancouver has hit the $1M in gross revenues over this past weekend (Saturday morning roughly). This is according to my tracking document and not an official release from the company. In terms of gross revenues, Toronto is 52.6%, Vancouver at 47.4% of gross revenue. 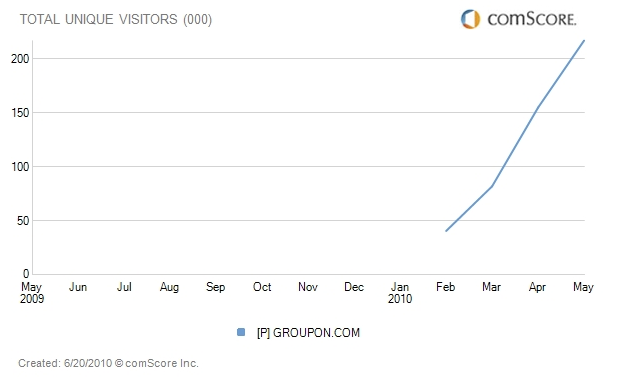 In terms of savings to consumers – Groupon has saved consumers $1.56M during this time. With respect to ComScore traffic, they started to register in February of this year and are a good upward trend, breaking the 200K UV mark in May. This entry was posted in Groupon and tagged ComScore, daily deals, Groupon, toronto, vancouver on June 20, 2010 by Darby Sieben.